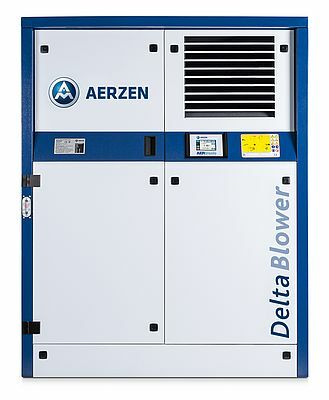 The Delta Blower positive displacement blowers helped the manufacturer Aerzen set standards and raised the bar ever higher for performance, economic efficiency and environmental protection. To expand upon the success of the blower series, an exciting new design sets energy saving records. The innovative assembly concept combines proven features and newly-gained advantages. Delta Blower G5plus achieves up to 5% more energy efficiency and offers more flexibility to meet even special requirements. Aerzen Delta Blowers Generation 5 are positive displacement blowers for almost any application and have already convinced many users by their robustness and long-life cycle. Especially, their performance data are impressive. They reach intake volume flows of 30 to 15,000 m3/h at a control range of 25 to 100% and overpressures of up to 1,000 mbar. The Delta Blowers convince in many industries, for example during water and wastewater treatment, aeration, filter backwash, pneumatic conveyance, gas conveyance, degassing or dedusting. Aerzen has developed the successful concept with the new Delta Blower G5plus and raised it to the next technological level. Apart from the known advantages of the series, it is the new compact design that attracts attention. It allows a space saving side-by-side installation and requires less space in the machine room. All blowers achieve oil-free operation class 0 as per ISO 8573-1 according to the AERZEN Environmental Concept. They are free of absorption material up to 100 % and require oil change only after 16,000 operating hours. Energy-efficient motors class IE3 are used as standard and suction is still at the cold side of the assembly. What is absolutely new with the Delta Blower G5plus is up to five per cent energy saving by means of an optimised intake filter silencer with lowest flow losses, high-efficient electrically driven fans and an optimised standard base support which makes reduced pressure losses possible. The warm exhaust air is routed over the roof of the acoustic hood to connect a separate channel for optional heat recovery. But the “plus” also refers to the additional comfort of Delta Blower G5plus: The new acoustic hood concept reduces the installation surface area by up to 10 % depending on the size and the acoustic hood door makes easier and faster access possible to facilitate the maintenance of the assembly. The multifunctional, extended base support creates a plus of flexibility by an integrated spark arrester (ATEX), the preparation for installation of a start unloading device, components for installation of third-party motors and a patented reactive silencer. Aerzen supplies the technically optimised and conceptionally enhanced Delta Blower G5plus positive displacement blower in two sizes for volume flows of 440 m³/h up to maximum 3,600 m3/h. Two more sizes are already planned and currently in development.